It’s not quite a pie, but it’s not quite a cobbler either. What is it? Delicious. My mom has an amazing Poor Man’s Cobbler recipe with a slightly more cake-like topping, which I’ll post some other time. But this is not Poor Man’s Cobbler. 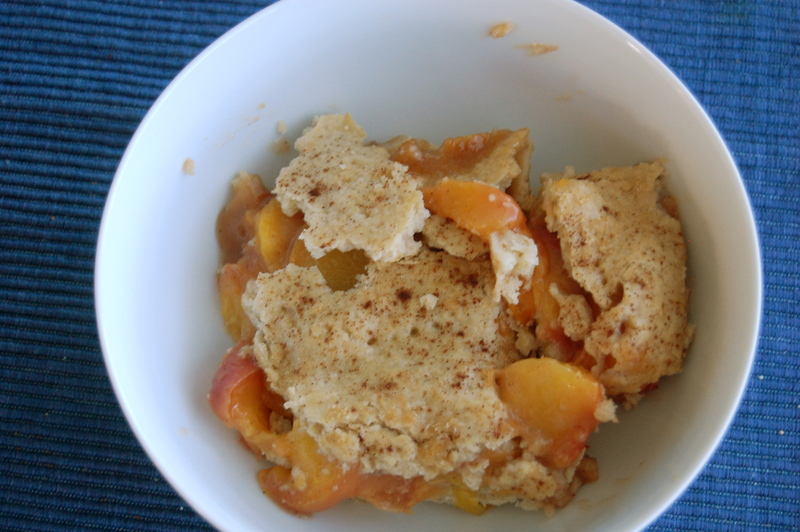 This recipe is a combination of cobbler and pie (like I know the exact difference, haha). Peaches are in season, and I can’t get enough of the big, juicy stone fruits. In season means cheap, and Sprouts had peaches for $0.47/lb.! Oh, the things that make me happy these days. The crust on this beauty is more flavorful than your average pie crust, but it’s still sturdy like a regular crust. And it’s really easy to work with! Side note: I think a stray nectarine may have made its way into the cobbler while I was trying to use up my fruit. The world did not end. This is a very low-maintenance crust, along with a superbly easy filling. I love low-maintenance things. I AM low-maintenance. Combine the flour, sugar, baking powder and salt for the crust. Cut in the butter with a fork or a pastry blender until crumbly. In another bowl, gently beat the eggs and vanilla and add it to the flour mixture. Add the milk and stir until it becomes a ball. Split the dough into 2 pieces. Press 1 piece down onto the bottom of a 9 x 13 pan as the bottom layer. Refrigerate the remaining piece of dough. Pit the peaches and slice them thinly (don’t worry about making them perfect). You can peel them if you don’t want to bite into the occasional skin, but if you don’t care about eating the skins, and peeling them is not worth it to you, then don’t do it. I sure didn’t. 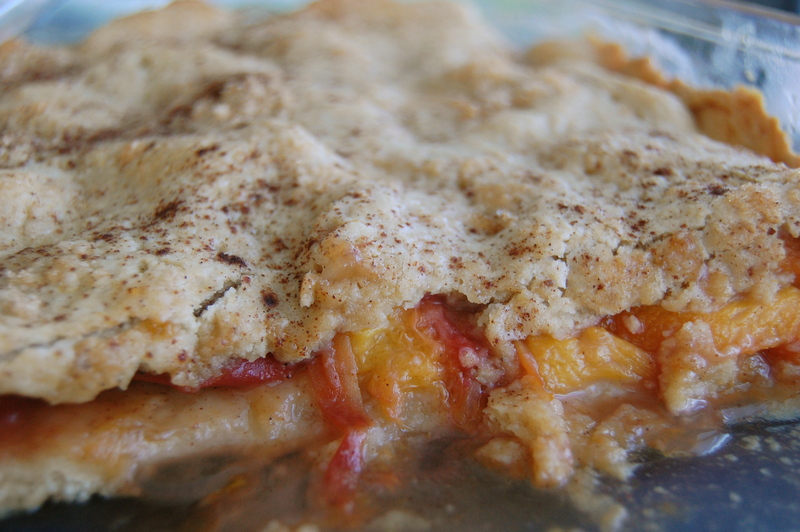 Stir all the filling ingredients together in a large bowl and pour into the pan over the bottom layer of crust. Roll out the remaining piece of dough into a long rectangle to cover the filling in the pan. If you’re fancy, use “a rolling pin on a floured surface.” If you’re me, use an olive oil bottle and roll it between 2 sheets of waxed paper. Place the dough on top of the filling in the pan. Poke it several times with a fork. Brush the top with the remaining Tablespoon of milk and sprinkle it with a little cinnamon and sugar. Bake at 350° for 45 minutes. Plop a dollop of Bluebell “homemade vanilla” ice cream on top of a serving in your bowl. Consume with glee. It refrigerates nicely, it doesn’t get soggy, and it doesn’t ooze out all over the place when you try to cut into it. By all that I mean to say, it’s great to bring to parties or serve to guests! 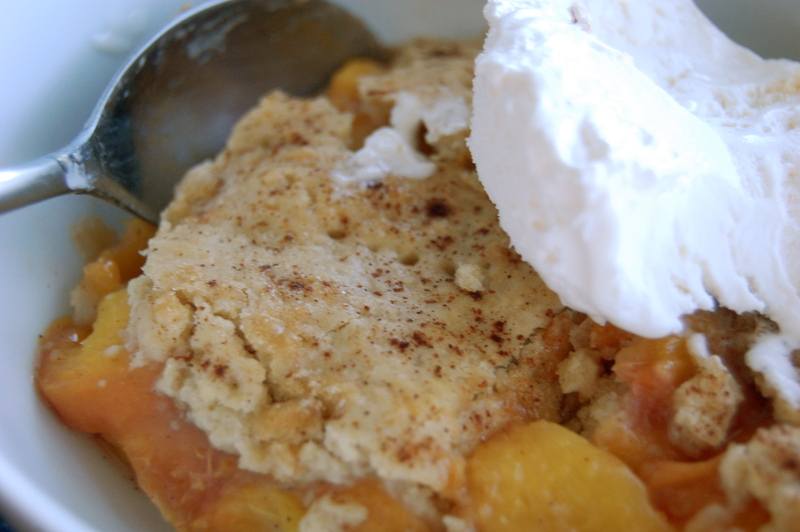 Your peach cobbler sounds like what I used to get at restaurants when I lived in Texas. This looks really good! I always thought cobbler meant it had to be served with ice cream, but I guess this isn’t the case?